I’ve written about grit on my blog. Grit has gotten me through a lot. Today I remember the person who has modeled grit to me my entire life. I will miss my dad. Forever. When I was a young girl, the house where we lived had a huge Cottonwood tree in the backyard with a swing. I have memories of being filled with glee while getting pushed by my dad, my hair blowing in the breeze. “Higher, Daddy! Push me higher!” I would squeal. He always did. I held on tight during the wild ride, and sometimes he threw in an underdog which made the ride even more thrilling. My dad worked hard as a computer programmer, salesman, and executive, modeling an incredible work ethic and the importance of treating others with respect. He programmed computers for the Apollo Space Program and worked at the Pentagon during the Vietnam War, although – to the end – he said the details were classified. He traveled the world with the International Sales Division of Univac. In his final occupation he built a successful computer consulting company where he was President, CEO and a mentor to many. He would tell you he found success in many areas of life because he was, “handsome, debonair, rich, influential, and educated,” which was true. But it was also because he was whip-smart, honest, loyal, determined, helpful, mischievous, and optimistic. He was a character and always put a smile on people’s faces. When people asked him how he was, he would reply, “Bordering on excellent!” He also had a fierce optimism about others, always believing that if he helped out, if he pushed someone a little higher, great things were possible. 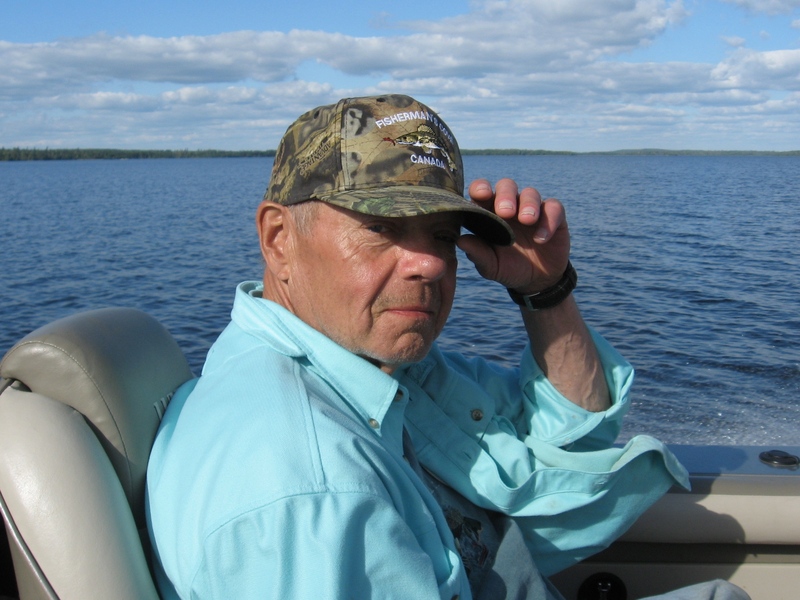 My dad lived life abundantly and wanted to help others do the same. One of his favorite places on earth was his and my mom’s cabin on Sand Lake. He remodeled much of the interior (in his signature knotty pine), built beautiful wooden furniture, could fix anything, and was a huge fan of starting blazing campfires with “Boy Scout Juice,” a mixture of old oil and gas. No project was ever too challenging. Most were begun with “Here we go now” and a pumped fist. Anything could be accomplished with hard work, a lot of thought, some tinkering, and the belief that in the end you’d be successful. He did all this to take care of his family and make sure we had a quiet retreat from an increasingly chaotic world. He was always protecting us and always working to give us a good life. Last fall I ran the Twin Cities Marathon. It was a drizzly day and I didn’t think my dad would be on the course because he had just been released from a short hospital stay. As I approached the highest elevation point on the marathon I saw my family and at the end of the line, my dad. He was there with a huge smile, the same twinkle in his eye, and his fist in the air. His determination had gotten him there to encourage me to challenge myself, to work hard, and to stay optimistic. He always pushed me higher on that swing in our backyard, and in life. His body is gone, but his spirit will always be with me. I know he will always push me higher, always push me to live life abundantly, and he’ll throw in an underdog at the highest elevation point for an extra thrill. “bordering on excellent”…love it…might steal that. His greatness lives on in you, Chrissy. Celebrate the cycle of life. This is so lovely, Chrissy. What a perfect tribute to your dad.